Bombasa Dribblers: Why Rupiah Banda is Winning Against Sata Where Frederick Chiluba Lost to Mwanawasa | Elias Munshya, LL.M, MBA, M.DIV. Frederick Jacob Titus Chiluba was never part of the political elite that developed in Zambia after independence in 1964. He was an outsider. In fact, this is the only reason that made him more attractive to his MMD colleagues in 1990 to challenge Kaunda in the first multiparty elections since independence. 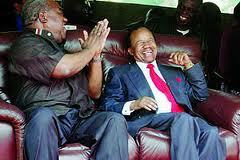 As such, Chiluba was not as politically sophisticated and his roots in power were very shallow. Apart from his trade union days – Chiluba was never at the axis of power during the Kaunda regime. He was never a part of the ruling aristocracy. As such, when his immunity was lifted after leaving office in 2002, he was an easy target. President Mwanawasa managed to put Chiluba in a corner and his lack of support depth demonstrated itself in the lack of real public and abiding backing for a man who had just ruled Zambia for ten years. On the other hand, Rupiah Banda had for many years been part of Kaunda’s ruling aristocracy. The years he had spent in Kaunda’s government both within the country and outside the country have proved that Banda could be a more formidable opponent against President Sata even as his immunity has been lifted. In the public relations battle after the stripping of his immunity, Rupiah Banda appears to be winning battles that Chiluba completely lost at the time that he (Chiluba) faced similar accusations. Rupiah Banda had been a diplomat under Kaunda for many years. He had in fact, as Zambia’s Minister of Foreign Affairs, served at one time as President for Namibia under a special United Nations mandate. As such, when he assumed the office of presidency in 2008, he could very easily tap into the power structures all across the SADC region and beyond. Since, power in much of SADC region is still held by the same clique of people that had held it since the 1960s, it was easy for Rupiah Banda to rekindle old political flames and sustain for himself a political base both within and outside Zambia. This political base included power brokers in Namibia’s SWAPO, in South Africa’s ANC, in Zimbabwe’s ZANU-PF and in other ruling political parties across SADC. As such, faced with accusations of theft and corruption by President Sata, Rupiah is able to very easily garner some sympathy from his friends in the region. This is the feat that President Chiluba facing the same problems could not just achieve. There is also an important observation to be made here. Whereas both President Banda and President Sata were Kaunda’s political children, between the two, Rupiah Banda had more diplomatic connections than President Sata. As such, while Sata is rarely known within the African independence political aristocracy, the same cannot be said of Rupiah Banda. As such, in the battle for public relations after the stripping of his immunity, Rupiah Banda is appearing as a victim and is able to freely tap into his old friends. It is said that Chiluba had about nine children. Rupiah Banda also has about the same number of children. It is quite interesting to note that Michael Sata does have a similar number of children too. Some put President Sata’s children beyond ten with different women. When Chiluba was assuming the presidency in 1990, none of his children were close to the political power base too. In spite of having children in the same age brackets as his other colleagues, Chiluba’s children were for the most part away from the political limelight and additionally; they lacked any real political, business or diplomatic clout. As such, in terms of family, Chiluba could not tap into the energy of his children for any political significance. This is one reason why to-date, none of Chiluba’s children have ever experimented with real interest in political affairs. Not only that, of Chiluba’s older children, none of them are as educated as children of either Sata or Banda. At the turn of the 1990 anti-Kaunda revolution, Rupiah Banda’s children were actively involved in MMD politics. In fact, one of Banda’s children Andrew was the MMD’s candidate for Chipata Central Constituency. The young Banda lost terribly in those 1991 elections in Chipata. When Chiluba was fighting his immunity battles and answering criminal charges, he had no visible support from any of his children. As stated above, they had no political or business clout. Chiluba was left to fight battles alone. With Banda, however, there is a huge difference. Banda’s children could be seen as liability, but they could also be seen as assets too during this bombasa prosecution. This is because, having children appear in public for him and support him, humanizes him and creates some doubts in some Zambians that the old man is just being persecuted by President Sata for no real reason. In fact, Banda’s son Henry is exiled in South Africa tapping into his father’s old friends. And as the Zambian police continue to whine about young Henry’s criminal allegations, President Zuma and his ANC stalwarts are happy to provide Henry the protection he needs. Henry is, somewhat, helping feed into the perception that President Sata is just treating President Rupiah Banda unfairly. Henry Banda, Andrew Banda and several of Rupiah Banda’s children realized the international significance of his father’s impending prosecution. As such, they moved quickly to find an international lawyer to represent them and to represent their father. Robert Amsterdam provides no real legal help to the Rupiah Banda criminal charges. What he brings to the table, however, is a powerful public relations stunt disguised as law. Amsterdam has represented several politicians around the world. But his real role is that of managing his client’s interests not in the courts of law, but in the courts of international public opinions. For example, it is clear from the way he has commented on immunity removal and parliamentary privilege that Amsterdam does not quite understand the operation of Zambian laws. But that is a secondary matter to him. He is a powerful force in helping Rupiah Banda and team to win a public relations battle -especially outside Zambia. Very early, after Rupiah lost the elections, Amsterdam started defending the legacy of his client. Before the face of the UN and other international agencies, Amsterdam was quick to ensure that his client received favorable coverage as a victim of President Sata’s corrupt intentions to fix his predecessor. And for that reason, Amsterdam has succeeded. When Chiluba was fighting Mwanawasa there was no Amsterdam to defend him. Chiluba’s public relations battle was not fought very well. He was left alone to face the Mwanawasa machinery. This time around that we have identical issues playing around, Rupiah Banda is more prepared than Chiluba ever was. Chiluba was acquitted shortly after Rupiah Banda assumed the presidency. Mwanawasa had died and the prosecution, which started in 2002, only concluded some six years latter. Zambians had grown tired of this prosecution. Chiluba came to be taken as a victim rather than as a criminal during this long trial. Indeed, when the acquittal came in 2009, it did not come as a surprise. In the minds of many Zambians, the immunity removal and subsequent prosecution of Chiluba had taken too long to be any significant in the fight against corruption. As such, Rupiah Banda is winning the public relations battle against President Sata partly because of how Zambians remember the last time an ex-president was prosecuted by the State. Among charges Mwanawasa had leveled against Chiluba was that Chiluba had stolen millions of dollars and stashed the cash in assets and bonds overseas. However, six years latter Chiluba had been acquitted of the $400,000 theft charge he had ever been prosecuted for. Additionally, the London civil case that the State had won in London returned to Lusaka without any significant seizure of the so called assets and bonds that Chiluba had stashed overseas. What happened, to all those allegations? Well as it turned out, the allegations that Chiluba had assets hidden in London came out to be false. With the London judgment President Mwanawasa could not even obtain one asset that belonged to Chiluba. The only solace the State found was to domesticate the London judgment so that they could go for Chiluba’s house in Kabulonga. As it turned out, all those assets Zambians were told Chiluba stole could not be found. The few tractors and boats that the State confiscated to date have not been accounted for and the Task Force on Corruption has not explained where they took the money they had collected from a few assets they had seized. The finding of the Chiluba cases left a bitter taste in many Zambians. They had been duped. This being the case, most Zambians do not seem to be eager to follow through another court case that might end up like Chiluba’s. It is this Chiluba outcome that is gifting Rupiah Banda with a public relations bonanza. If Mwanawasa’s accusations proved to be false, what makes an ordinary Zambian believe that Sata could be right about President Banda this time around? And of course the time and money spent on Chiluba’s prosecution amounted to $10 million dollars most of which was funded by the donors to go to legal fees in both London and Lusaka. In Lusaka, Mutembo Nchito and Company lawyers were the main beneficiaries of this money. The donors had also believed that Chiluba had stolen. This is why they invested their millions in Mwanawasa to help him find the culprits and punish them. Except that it had taken very long, and the case against Chiluba had turned into a debacle only to have significance latter this year with the removal of Rupiah Banda’s immunity. After the death of Mwanawasa, European countries and donors did not like the Rupiah Banda presidency. They had some belief that Rupiah was corrupt. In view of this, they found a willing candidate they could support – opposition leader Michael Sata. Europeans, especially liked Sata’s anti-Chinese stance. In a battle for resource supremacy, surely, the West was going to benefit from an anti-China future President Sata. Except that, the West really did not know what they had bargained for. After Sata had won the 2011 elections, the first act of his presidency was to decree the change of names of the Zambian international airports. If anyone thought that Sata was going to be a president for the future of Zambia, it left no doubt that Sata was not going to be a president for the future but for the past. Western capitals got more shocks when instead of deriding the Chinese; a newly installed President Sata did a U-turn and feted the Chinese instead. More policy confusions were to follow. In appointing cabinet, President Sata abrogated constitutional requirements and nominated 2 more MPs than the constitution allowed. Even if this was a small mistake – what it represented was worrisome. A president with a tax paid contingency of staff and advice cannot make such a basic mistake. It is either he did not ask for help from his advisors or he asked for it and ignored them. Regardless of how you look at it, a dictator had been birthed in Zambia, and the Western capitals would regret the support they gave him. Within months of a Sata presidency, civil liberties had deteriorated in Zambia. Opposition leaders were arrested and faced intimidation from the police. These singular acts of presidential terrorism would make ex-president Rupiah Banda appear like a saint. Already, Western civil society organizations looking for an African hero, started to court Rupiah Banda. Boston University called him into residency and Jimmy Carter asked him to observe elections in many parts of Africa. 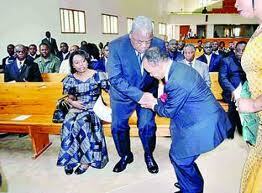 In the meantime, Michael Sata’s thirst for confusion continued unabated. While all this is going on – Banda’s esteem in the eyes of the West was growing while Sata’s was diminishing. The same trends were happening in Zambia among the ordinary population. Suddenly, Banda started to appear like a saint. Chiluba never had anything like the fortunes Banda has. Mwanawasa received lots of support from the West during the prosecution of Chiluba. Additionally, students, churches, as well as general population went to parliament hill to support a parliamentary motion to strip Chiluba of his immunity in 2002. In 2013, when parliament was debating to remove Rupiah Banda’s immunity, not even a single crowd had gathered to offer support. Michael Sata had lost a public relations battle that Mwanawasa handled very well when dealing with prosecution of his predecessor. On 15 March 2013, Wynter Kabimba stands up in parliament and moves a motion to strip Rupiah Banda of immunity. Among charges Kabimba reads are Rupiah’s acquisition of lollipops and branded underwear. The charges appear similar to what Mwanawasa had alleged Chiluba had done. But there is a difference. President Mwanawasa was regarded as quite sincere in his desire to prosecute Chiluba. With this perceived sincerity came some public sympathy. But with Kabimba moving a motion to strip Banda of his immunity, the public is not as sympathetic. Hon Kabimba himself is facing accusations of corruption. He is alleged to have solicited a bribe from an oil company within days of the Michael Sata presidency. If a maxim of equity states that “he who comes to equity should come with clean hands”, the public does not perceive Kabimba to come to equity with those clean hands. Kabimba has dirty hands and his involved in the immunity saga just goes to work to Banda’s advantage in the public opinion. Banda is winning where Chiluba had lost because of shady characters such as Wynter Kabimba. If Mwanawasa fought Chiluba due to corruption, it is clear that Sata is fighting Banda not because of corruption but because of politics and personal unbridled hatred. Indeed, now that Zambia is having the second crack at the bombasa prosecution, it is clear from the outset, that times and circumstances have greatly changed. Chiluba, the accused lost much of the public relations battle when dealing with Mwanawasa, but this time around it seems it is Banda, the accused who is winning the public relations battle. What remains, however, is to see how this will actually translate before a court of law. “Not guilty” is what Rupiah Banda has pleaded before Magistrate Joshua Banda. The public does seem to agree with him. Intelligently written article. Thanks for sharing your side of the situation. I agree with most of your points. However, I am not just sure the weight of Mr. Banda’s regional support in this issue. He may have support and international sympathy, but given Sata’s position in the region and beyond, Mr. Banda’s regional and international sympathy may turn out to be immaterial. Given the political landscape in Zambia, to what extent can we expect the judicial system to bend because of regional and international pressure in favour of Mr. Banda? Yes,well explained especially on Chiluba and Mwanawasa head on,but one thing you should not forget is people are moving with time and that includes Zambians,so according to what most people I have asked concerning Rupiah Banda’s case they are saying he is guilty and he must be charged basing on what he done to this country Zambia. Very insightful and well articulated analysis…as usual! Very interesting analysis. However, I think you may be a bit off base in your argument that Amsterdam does not serve a legal function on the case. That would be a very narrow view of international law. It’s true that once the PF banned Amsterdam from entering the country, there is little he could do before a Zambian court. However, as a licensed solicitor in the United Kingdom, Canada, and the United States, there is quite a lot of legal work he can do in international forums. His job eventually may be to open up complaints against key PF individuals in foreign courts. We’ve already seen what Amsterdam has done for the rest of the opposition before the Commonwealth, while other petitions before both regional and international bodies are likely to follow. For example, there could be lawsuit forthcoming on grounds of defamation or wrongful prosecution against the PF. Recall that Chiluba’s case went to the U.K. I think that in this day and age, especially on politically charged cases, lawyers must do more than just submit briefs before the Lusaka High Court. This is good Rev. I like your articles, I wished I could reach this level of objectivity. I think RB and ourselves should brace ourselves for a very long ride. I hope this case does not come back with technicalities of who was civil servant or not. This analysis is on point,contains no ambiguity and is unbiased .Well articulated Mr Munshya. Nicely put. I disagree that most Zambians think Rupiah Banda is innocent. Most Zambians think he won’t go to trial because they believe the politicians while on opposite sides still protect one another and just use this to gain political mileage . Lucy what empirical evidence is your assertion based on? This is an interesting analysis…i hadnt quite looked at the situation in this light. Very informative and well worth the read. This is an insightful well analysised article. I also thought the same its nice to read such articles… Your articles are normally non biased well analysised and written in good faith. Thank you Levi. I am happy you enjoyed the read.